Local residents John and Kathy Levo recently found this poster of late Hillsboro resident Joe Hiestand in Springfield. 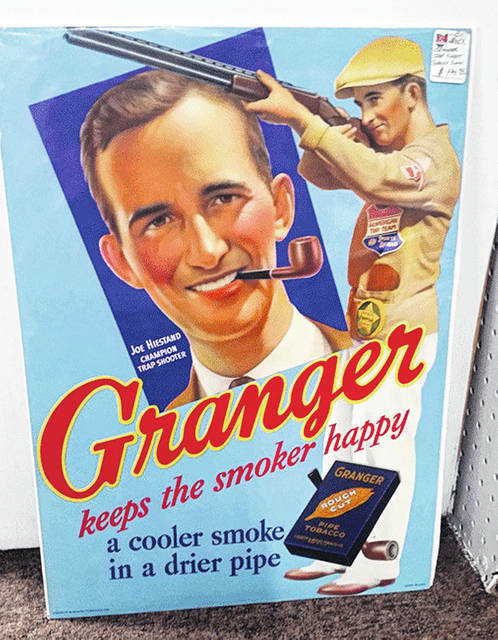 John and Kathy Levo recently were spending a sunny Saturday at the Heart of Ohio Antique Center in Springfield when they came across a face familiar to Highland County history buffs. Hiestand certainly looked happy as he beamed with a pipe clenched in his teeth. On the right-hand side, another image showed Hiestand, a Hall of Fame trapshooter, aiming a shotgun. Surprised by the find, the Levos took a photo of the poster. After they returned home, John, who serves as treasurer on the Highland County Historical Society Board of Directors, sent an email to the board to let them know of their discovery. Curious, John did some research and added that the poster was produced in 1934, much earlier than he suspected, and he found that such posters are rather rare. From there, members of the Highland County Historical Society board began to take action. Nancy Wisecup said she thought the poster would look good at the Highland House Museum and suggested perhaps a few members could pool their money to help purchase the poster and bring Joe Hiestand home to Hillsboro. And they did. Along with Wisecup and the Levos, John Kellis, Carolyn Hastings, Bob Brown, Jim Rooney and Justin Harsha agreed to pitch in. Then it was time to see if Ol’ Joe was still hanging out in Springfield. Kellis offered to go and see, but John Levo said he and Kathy would be heading back up the following weekend, which they did. And that’s when Joe Hiestand came home (at a lower price than what was on the price tag, by the way), thanks to members of the Highland County Historical Society Board of Directors. For the younger generations who might not be familiar, Joseph Franklin Hiestand was born Nov. 26, 1906. A farmer by occupation, as a young man Hiestand gained national and international fame as a trapshooter. His skills in target shooting were recognized at early trapshooting competitions at the Ohio State Shoot and the Grand American. He began winning major championships in 1931; and in 1938, began a run of consecutive targets broken. His marksmanship became legendary as he attained and held for 21 years a record of 1,404 consecutive registered targets without a miss. At the time of his death, Hiestand was one of five top record-holders in the Amateur Trapshooting Association, competing in Europe, Cuba, South America and Mexico. In 1973, he was inducted into the Amateur Trapshooting Association Hall of Fame. During World War II, Hiestand received a commission in the Army Air Corps, and was in charge of Gunnery Training Instruction for aerial gunners. Leaving active duty at the close of World War II, he remained a member of the Air Force Reserve, attaining the rank of Lt. Colonel. With his election as Highland County commissioner 1957, Hiestand began a career in public service. He served two terms as commissioner. In 1965, he was elected representative to the Ohio General Assembly, where he served for five terms. Joe Hiestand passed away on Oct. 5, 2004 at the age of 97. And more than a decade later, a rare piece of Highland County history has come home to stay. Steve Roush is vice chairman of the Highland County Historical Society Board of Trustees. He can be reached by email at roush_steve@msn.com. https://www.timesgazette.com/wp-content/uploads/sites/33/2018/08/web1_f-Hiestand.jpgLocal residents John and Kathy Levo recently found this poster of late Hillsboro resident Joe Hiestand in Springfield.